BEAUTIFUL ! Music, Sets, Costumes, Special Effects & especially, the beautiful portrayal of Cinderella , as done by Lily James. Absolutely loved every thing about this movie ! If only a few more of us could behave with the grace, humility, & kindness as portrayed in the movie, (in spite of the cruelty). How about that kind of "America Great again" . It doesn't have to be fantasy land ; as it is sometimes demonstrated, more often in times of crisis only. I think I'm going to surround myself today with some good people by going to see it again. (One character trait subtly revealed was her intellect). 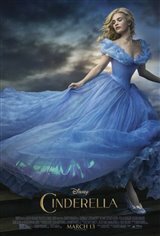 Cinderella ~ Old fairytale with a new twist...Loved it! Can't wait to see Tim Burton's version of Dumbo! Loved the movie,they got it just right! Beautifull acting and Great backround music.Loved the special effects. Really enjoyed it and i am a man in my 60's. Emily James an excellent Cinderella and Cate Blanchett very good as the cruel stepmother. Also, the scenery was beautiful. Had a good message about being graceful and forgiving under difficult circumstances .So much better than the garbage and filth that passes for movies these days. Very good family movie. Loved it! It stays true to the Cinderella Storyline, but in it's own way. The costumes were amazing! Loved this movie! It made me feel like Cinderella. And I'm a man. A truly beautiful movie. Well worth seeing for the pumpkin coach alone. The scene where Cinderella flees before the clock strikes twelve is wonderfully done. Don't miss it. The trailers don't do it justice. Fantastic movie! The cast is stellar. I particularly loved Lily James' acting. She is a perfect Cinderella! Cate Blanchett also is the perfect evil stepmother. The costumes are stunning. Don't miss this wonderful film! Loved this, great acting, especially loved Helena BC as fairy godmother. The costumes were breathtaking - fantastic special effects, Walt would be so pleased. It was humorous and sweet and lovely costumes!!!! Enjoyed it!! The Cinderella Movie was Refreshing to watch. It taught Morals of Courage, Kindness and Forgiveness. Thankfully the Movie was Non-Verbally and Non-Physically violent. It only Hinted of the Stepmother and Stepsisters' unkindness towards Cinderella and was Profound when In one of the last scenes Cinderella Forgave her Stepmother for her unkindness towards her. This movie Teaches that We Will Find True Joy as we Demonstrate Love towards our fellow man. I Have and Will Recommend this movie. This movie is so fascinating. I have to go and see it again. Great work Disney !! Loved it! Saw it with the grandgirls and they were delighted! Well done in every way, we loved it! Beautiful movie. Stayed very close to the traditional story and the new updates added to the story line. All the costumes were adorable and reflected the costume designers knowledge of an earlier period in time. The cinema was full of young children when we visited and they sat silent throughout the film. We need more movies like this one. Straightforward, beautifully done retelling of one of the most familiar stories. Well done Disney!! For a children's fairytale, it was nicely written with depth for all characters, all adults any age could appreciate whilst still being enjoyable for kids (but not too young!). I loved how the story played out, all the special memorable classic moments beautifully done. Worth seeing again without hesitation. I loved Cinderella's dress and the dance with the prince at the ball. Cinderella was one of the most beautifully done fairy-tales brought to life.The cast were spectacular, and you could truly feel the magic! What a beautiful movie, they should make more movies like this. Lily James is perfect in it, she's just adorable. Great cast; A sweet movie for all ages. My daughter and I absolutely loved it. She was laughing at the adult parts to keep up but definitely caught the 5 year old humour in it too. We both agreed the lizard footman were a little creepy but Cinderella, her dress, her singing, her amazing fortitude beautiful. They did wonderful casting and now we have a name for Prince Charming!